In collectors’ circles, ‘Balloon Tire Bicycles’ are now considered a separate genre that started in 1933. The new 26 inch balloon tyres were wider than the 28 inch tyres previously used on bicycles, and they were the first to be fitted with inner tubes. 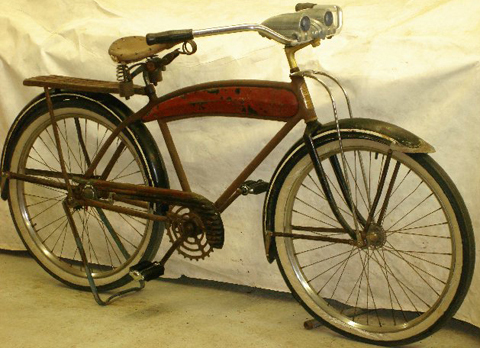 But bicycles at that time also underwent a major styling revolution, with each company creating increasingly stylish streamlined designs that mirrored the railway trains, Greyhound buses, and the most luxurious automobiles of the era. 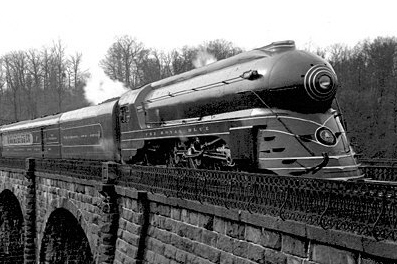 Consider the influence of trains such as the B&O Royal Blue (pictured below) on the style of other forms of transport. Born in Moscow in 1901, Count Alexis de Sakhnoffsky emigrated to Switzerland in 1919. He studied automotive engineering and, combining this acquired knowledge with a fertile imagination, he embarked on a career of designing custom-built sports cars for the rich and affluent. He relocated to North America in the late 1920s and became one of the top industrial designers of the 1930s, making major contributions to streamline design in the Art Deco era. [Art Deco was born in 1925, the name coming from the 1925 Exposition Internationale des Arts Decoratifs Industriels et Modernes, held in Paris, which celebrated living in the modern world. Today, Art Deco refers to a mix of styles from the 1920s and 1930s. The Art Deco era ended with the start of WW2]. 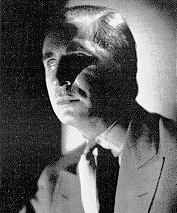 In high demand as a stylist, Count Alexis designed diverse products, including clothes, toasters, furniture, the Emerson BD-197 radio (nicknamed the Mae West), boats, the 1936 Labatt Streamliner truck, pedal cars (for Murray’s Steelcraft company) as well as vehicles for Cord, Auburn, the White Motor Company, LeBaron, Packard, American Austin, Bantam and others. One of his most notable automobile designs was the 1934 12cylinder Packard 1108 Sport Phaeton (for LeBarron), said to be one of the most beautiful designs of an American coachbuilder. A new magazine for men called ‘Esquire’ came out in Autumn 1933. Sakhnoffsky became the technical and mechanical editor and the magazine became a showcase for Sakhnoffsky’s design concepts. 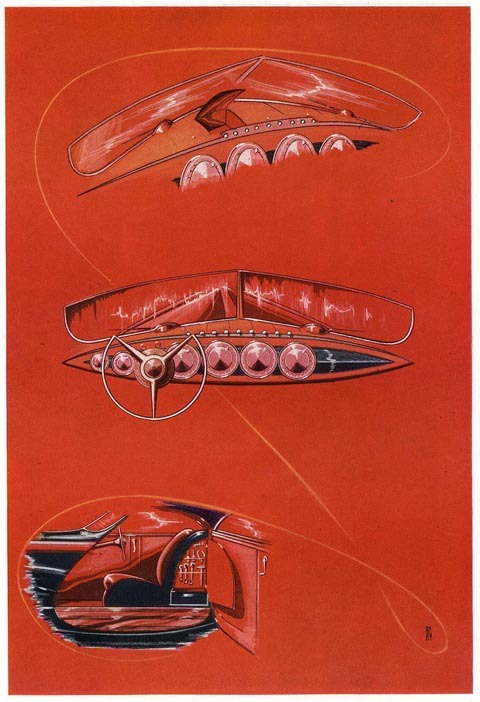 Each month readers were treated to drawings of futuristic cars, trucks, boats and other examples of mechanical wizardry. He served on Esquire until the 1960s. When Murray Ohio Company of Cleveland, Ohio decided to enter the bicycle market in 1936, they commissioned the Count to design their product range. Count Alexis designed a 1940 Nash roadster called “The Golden Chariot ” and plated in 24 karat gold to sell war bonds during World War II . This car was for sale during the 1940s for $25,000 and there is a newspaper clipping on the rear of the photo describing it . It was owned by Professor Andrew Primo , New Orleans, Louisiana . The car was shown during a war bond drive with a sign attached , ” Kill a Nazi ! Kill a Fascist ! One Dime One Bullet will kill a Jap ! … History is in the making.” According to the article this was the first war bond car made. Joining the US Army in WWII he rose to the rank of Lt. Col. at war’s end. In the early 1950s Sakhnoffsky teamed up with Preston Tucker (After Tucker’s tumultuous acquittal from an SEC trial over the Tucker ’48) funded by investors from Brazil. 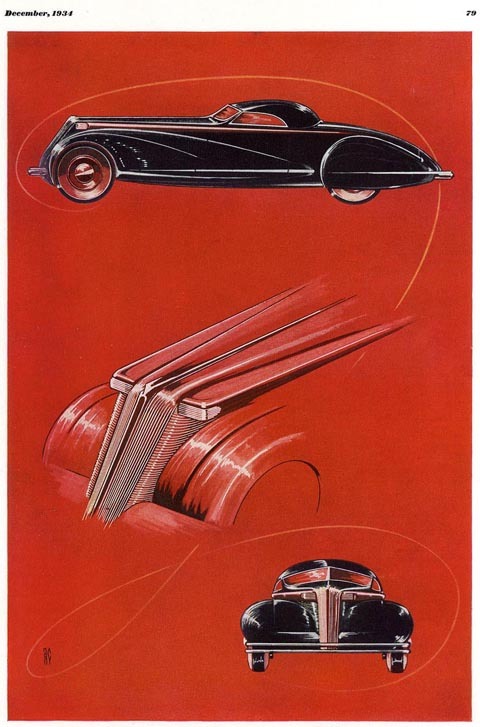 They began initial designs to build a sports car called the Tucker Carioca. But Tucker’s travels to Brazil were plagued by fatigue and upon his return to the United States he was diagnosed with lung cancer. Tucker died from pneumonia as a complication of lung cancer. The Tucker Carioca was never developed. The Count died in 1964. Note the extra long handlebar stem – it is missing its dual pod headlamp, which mounts onto the stem. This is an item which has a value considerably more than that of the bicycle! I really like this model of Mercury, designed by Count Sakhnoffsky, so I can live without the headlight for now. I’ll update the page after the bike arrives. This bicycle was totally ahead of its time, and its innovative features were subsequently reproduced by many other manufacturers. It has streamlined pedal cranks (not requiring a dogleg to clear the chainguard). It was the first bike with a built-in side kickstand. The model was fitted with an anti-shatter rear reflector. Hubcaps were fitted to the axle ends. Manufacturer (chasis): White Motor Company of Canada Ltd., Toronto, ON. Manufacturer (body): Smith Bros. Motor Body Works, Toronto, ON. Client: Labatt’s Brewing Company, London, ON. In the period following prohibition in Ontario, heavy restrictions limited the ability of alcohol producers to advertise their product. Thinking laterally, in 1935 Labatt’s Breweries commissioned world famous industrial designer Count Alexis de Sakhnoffsky to create a distinctive delivery truck that would give the company instant brand recognition. The Canadian made Labatt Streamliner hit the roads in 1936, garnering tons of attention from the public and winning awards for its unique design.